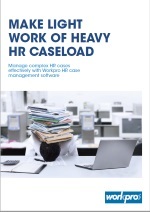 Complying with process is one driver for the implementation of an HR specific case management solution. Being able to provide maximum value and service to a fairly large workforce, from a relatively small HR base, is another. Workpro HR has been specifically designed to manage in-depth HR cases effectively, confidentially and in compliance with due processes.